We are happy to announce that the 14th issue of The Funambulist Magazine, entitled “Toxic Atmospheres” is now published and available online and very soon in our partner bookstores. This issue draws on the concepts of “being-in-the-breathable” (Peter Sloterdijk), “the weather” (Christina Sharpe), and “combat breathing” (Frantz Fanon) to resolutely politicize what is usually approached through an environmentalist perspective. The toxicity described throughout its pages are the atmospheric conditions of colonialism, imperialism, and/or capitalism. This includes the use of weaponized chemical agents such as teargas (Dariouche Kechavarzi-Tehrani) or agent orange (Ylan Vo), colonial and nationalist political programs testing and mobilizing nuclear weapons (Samia Henni) or energy (Lisa Torio), methane pollution as a part of US settler colonialism (Sonia Grant), the hegemonic designation of toxicity by European pharmaceutical companies (Chanelle Adams & Sarah Boisard), the need for Black microclimates of emancipated air (Christina Sharpe), a story on waste management in Lebanon (Jessika Khazrik), and a curing center on the US-Mexico border (Alexandra Cortez). 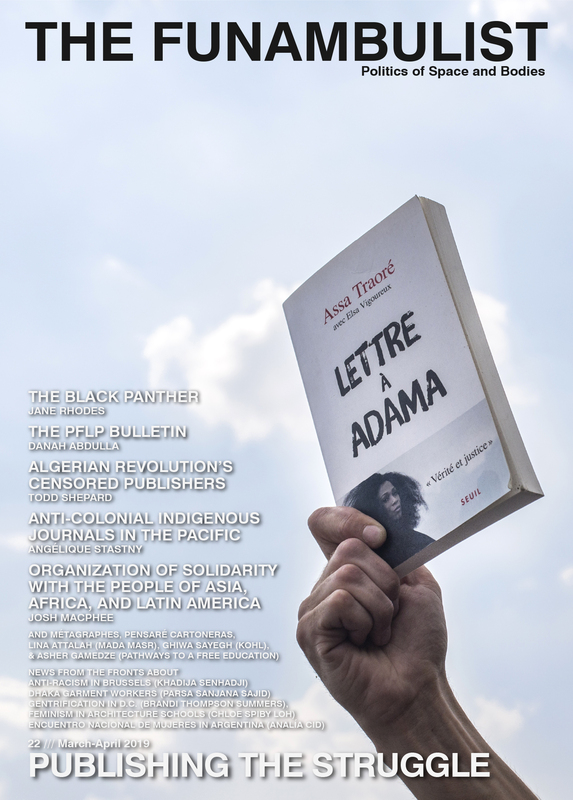 The issue also contains political reports about the occupied Golan Heights (Aamer Ibraheem), LGBT organizing in Thailand (Patnarin “Trong” Wongkad), and the Rohingya genocide in Myanmar and Australian detention camps (Imran Mohammad). Contributors: Aamer Ibraheem, Patnarin “Trong” Wongkad, Imran Mohammad, Dariouche Kechavarzi-Tehrani, Ylan Vo, Samia Henni, Lisa Torio, Sonia Grant, Chanelle Adams, Sarah Boisard, Christina Sharpe, Jessika Khazrik, and Alexandra Cortez. We continue our examination of colonial structures with this fourteenth issue. The last issue, “Queers, Feminists & Interiors,” was well received and we recently had the opportunity to listen to João Gabriell speaking eloquently about his contribution “Congratulations, You’re Hired! Navigating the Capitalist Workplace and its Violence as a Trans Person” to this issue, as part of a series of events dedicated to Black masculinities at the bookstore Les Mots à la Bouche in Paris. We took a particular pleasure preparing this issue for you, commissioning pieces from exceptionally young writers from various places of the world (Jawlan, Lebanon, Japan, Thailand, and many more). Although this issue does not embody the most unequal geographical repartition of the entire series — far from it — the repeated absence of articles situated in Latin America (with the exception of Alexandra Cortez’s project situated on the border between El Paso, NM, and Ciudad Juarez) has reached a problematic point — only eight locations in Latin America and the Caribbean have been mobilized in the first 13 issues — for which we have to apologize. Although we’ve been granted the indulgence of our friends involved in the various political struggles in these territories so far, we want to address this problem and call for contributions about various forms of decolonial analyses/organizing in the Caribbean and Latin America, in addition to the ones we’ll commission ourselves. If you read this text, it is likely that you either ordered this specific issue or subscribe to the magazine, and we thank you very much for your support. We would like however to urge you to invite your friends and colleagues who may be interested in the magazine’s content to subscribe as well, since most of our funding comes from this monthly income. In exchange of your support, we take the engagement — as we did since this endeavor started — to always do our best to comply with a high ethical standard when it comes to the way the magazine generates and redistribute its economy. As written in the last issue’s “behind the scenes” section, this standard is far from perfect: it means that commissioned contributors (authors of guest columns and articles) and photographers are paid for their work, but the sums are nowhere close to their actual efforts and the time spent to produce it. Similarly, bookstores in Colombia, Portugal, Nigeria, or Hong Kong get to sell the magazine for 50% of the normal price, but the latter (12 euros) remains prohibitive for most people. Sometimes, the right decision appears in the form of a compromise. Other times, the “right thing to do” (such as refusing to use a much cheaper printer because it operates in places where the welfare of the workers is not verifiable) is more obvious, despite the illusion of dilemma that the prospects of an easier option produce. In a system that perseveres each day in pushing for such easier, more profitable options, we believe that a balanced economy, operating under our own political terms can be reached, despite the many difficulties that it implies. This however means that we are transforming an already difficult economic situation — ask any other independent media editor about it! — an even more arduous one with, at the moment, little visibility of the future. We therefore need economic support proportionate to the very generous feedback we are regularly getting in relation to the content of the magazine. This is neither a cry for help, nor a call for charitable spirits but, rather, an invitation to think of the ways such content can be produced durably and with the growing ambition of the ideas we support.